Meeting the awesome team behind Meet Manila was an enriching and humbling experience. Getting invited to their launch party was to me, by a long shot. I've never considered myself to be well-known in the travel blogging community just yet so I was surprised. But I owe it to my amazing followers who've been supportive of every journey that I've made. The launch of Meet Manila introduced the 'Tertulia Night'. I actually had no clue as to what a Tertulia meant, all the more what transpired from such an event. And as I've been enlightened of its true meaning later on, I suddenly felt real excitement for this 'upcoming social gathering'. Now, it wasn't your typical 'party'. The 'Tertulia' itself meant more like an evening affair or a soiree of sorts. So you can just imagine a festive occasion where some of the most inspiring Filipino individuals come together to share their personal views and to meet for the same causes. Meet Manila is actually the brainchild of Ms. Ysobel Hamidjojo of Loudwhistle Inc. I was happy to have finally met her in person. Not only was she very interactive with us 'tweeps' online (a term used to identify people on twitter), she was also very nice in person. I was very much stunned when she said 'congratulations' and made beso-beso with me right after our short 'shining moment' on stage. She's now one of my idols, as she and her wonderful team has successfully made #ThoughtfulTourism a remarkable achievement (special mention to Ms. Francesca and her bubbly personality!). Anyway, after coming home from a 3-day trip from Batangas, I immediately changed into my Filipiniana-ish outfit and went straight to the venue. Guests were also asked to come in their Filipiniana attires. But I, on the other hand, had no luck finding an outfit that would best match my budget and body frame. The closest that I could get was wearing this linen, mid-sleeve blouse with intricate embroidery. This, I pulled right from my Ate's closet. Now, the Tertuila Night was held at the Adarna Food and Culture Restaurant (along Kalayaan Ave.). I got there about 6:30 pm and was instantly welcomed with a form of darkness. I looked straight at the place and started asking myself if I had the right directions. My initial reaction was -- deserted restaurant? I was later on informed that an electrical wire had just been cut from its post, causing multitudes of vehicles and people who rode past the hanging wire in a chaotic phase. The place had just experienced an unexpected black-out. But despite the mishap, the organizers behind the event still made the night more inviting for all of the guests. There were actually floating candles on a water fountain, and several more around the establishment. Also, after getting called, a fellow blogger -- Gabz of Pinoy Travel Freak was also awarded as an Empowered Traveler, along with new blogger acquaintances -- Ms. Vera Venus and Mr. Jaypee David. It was truly a winning moment, just being in the presence of these remarkable people. When we got off stage, a cultural performance was then being prepared to help end the night. Four kinds of Filipino dances were showcased that evening. And as the lights came back, a little rain transpired. But the dancers were professional enough to brave through this certain situation. I was, and still honored to have been invited to Meet Manila's launch party. Not only was I in the midst of intellects and inspiring advocates, I was also given the opportunity to partake in such a wonderful travel community. 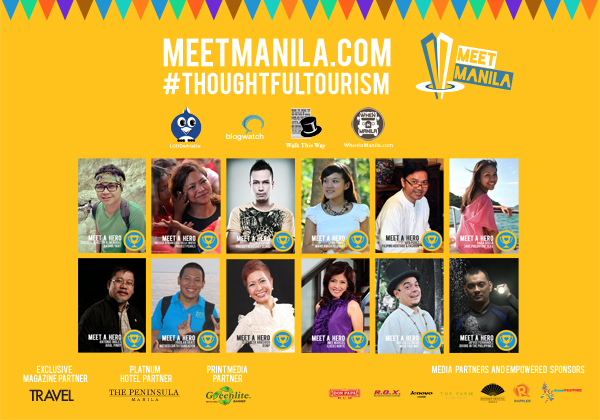 I will truly make every travel count for #ThoughtfulTourism! Hello Mai, congrats again! Wow, new phone! Hehe :) Sayang d na tayo nagka-usap after ng awarding. congrats Mai! I think it was a great event! Great Job! Congratulations! Keep it up!!! Wow! Being part of it is really an achievement. Way to go. Congratulations for being an empowered traveler ! You must be proud of this. This is a rare opportunity and being a part of this means that you are such an inspiration to many. Congrats and keep it up! Thanks so much Athena! Onga, I'm grateful for the new phone.. still tinkering with it, as I'm still confused by its features.. hehe! wow congrats Mai for the phone gift and for being an Empowered Travel blogger. inuna ko na yung sa phone kasi no strings attached haha, may issue kasi ako nasagap dun sa isang awardee eh. I wish I was able to participate on this one. Sigh. I am not much of a traveller so I can never hope to win something like this...hehehe. Congratulations! You're lucky to be a part of this event. Congrats and more travel stories to come. The images speak for themselves! One truly fun-filled and a worthy experience! Congrats to you Mai! Keep it up! Wonderful! such an awesome event. Congrats!!! Thoughtful tourism sounds like a very good concept. It's great that there are social groups like this for Filipino travelers. Congratulations to you. one of the Empowered Traveler. This calls for a celebration... TAKE CARE! this looks fun. Nice to know that there are occasions such as this. Wow..that does not only sounds brilliant initiative..it is in fact towards a more meaningful and sensible tourism advocacy..Well done indeed Mai.